The best racing formula in the world! If you have got access to the Finite Element analysis that is indeed a very useful feature. Most chassis are strong enough to stop the wheels falling off, but what really makes a difference is the chassis stiffness. A chassis that twists too easily will alter its suspension geometry and undermine the effectiveness of the suspension design and any set up adjustments. The major chassis stiffness limitation on our cars is the big hole for the driver and passenger( mine never turns up so I have taken his seat out). Front-engined cars can have a tranmission tunnel to help stiffen it up but they need another hole for the engine. Rear-engined cars should have nothing but roll hoop braces in the cockpit area and you will need something to attach the rear suspension to. So there is plenty to think about. If you are new to welding try The Welders Handbook by Richard Finch Updated edition(it's cheaper) also by HP Books at http://www.penguin.com. Its a good primer. I think the student version of Solidworks has the COSMOS FEA module in it. It's reasonably easy to use, but like all FEA (and CFD every more so) capable of producing complete nonsense. If you want to start a verbal punch-up, getting a few "CAD monkeys" (oook) together to argue about whether ProE or Solidworks or A*t*C*D are the best is a good way. it was just to see if i could draw a chassis, useing 3D sketching and then makeing them into beams etc. i also tried a bit of doing the body work. I have done a course on Catia and I thought that it was really good. You are right, Ray about the ability to produce nonsense from FEA models. However if you use it to compare the strength and stiffness of alternative designs or design modifications then it is very useful and easier to use. To predict actual values of stress and deflection does require a great deal more specialist knowledge. Looking at your chassis Chris, I think your instinct for a stiff, strong structure is very good. However there are a few places where loads are applied in the centre of an unsupported beam, such as the rear roll hoop brace. Basically every shape in a space frame should be a triangle or a tetrahedron. In practice, it is rare for a designer to achieve this completely, and the art of design is to get the best compromise. The book I recommended gives quite a good explanation of space frame design and some useful examples of good and bad practice. Look up the Maserati Birdcage on the internet to see a completely demented spaceframe design, but a very good racing car. Our chassis are about 900 to 920mm wide. Are you surface modelling the shape - I wish I knew how to do that. thanks for the dimentions, is that including the wheels? and what about length? ill try my best to explain how i did it though. i started off with a 2D sketch and drew out the bottem set of framework. i then selected the 3D sketch mode which alows you to draw lines in X,Y and Z. so i could draw the 3D elements. after i done the 2 side parts of the chassis (where the thicker beam runs down the length of the car) i triangulated as much as possible and where i thought it would be necessary. then i realised i hadent included the rollcage so i drew it in useing the 3D sketch tool. 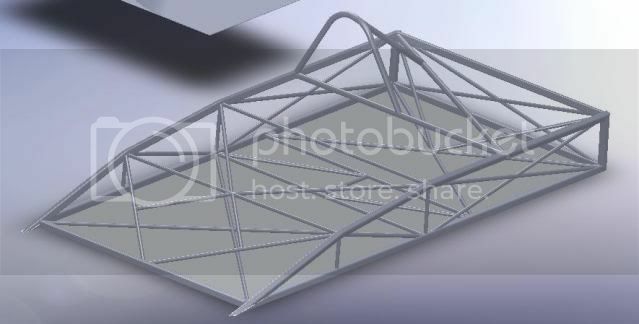 The overall dimensions for my chassis are 2400 overall length, 910 across the cockpit x 330 high. at the front it is 470 wide x 254 high. The wheelbase is 2020 and the track (that is the distance between the tyre centrelines) is 1270. all dimensions are in mm. to cut a long story short, i wouldnt be able to afford the other options, and designing my own car seems to be very hard especially as i dont have any of the parts of the car to take measurments etc, so im thinking about buying one (maybe a slightly rusty one) and repairing it to race. Location: In the Pitt Lane ! Ok i have looked into the same things as you. Yes you will get a car in the back of a transit with internal ramps at an angle over the wheel arches, except for the door openings which are about 1.4-1.5m so that would mean a very narrow car or a hugely modified pair of doors. A luton will be no problem but would need some sort of ramp lift to get the car in with low ground clearance. I also looked at a Fvee because they are ultra competitive and you can get an old one pretty cheap. But being an ultra competitive series unless you spend a fortune on the engine (which are prone to blowing or needing costly rebuilds through out the season like the reliant was) you will just plod at the back. Which is fine if you want to do that. I ended up with F750 because you can spend a little money on a good engine that should be good for a few seasons with limited freshening up. That alone will save you a fortune in running costs. As for van insurance I would get a quote on that, typically vans cost more to insure then cars as they are bigger and generally used for high mileage and business usage. I too looked at the internal option when I bought an Iveco Daily. Yes it will go in, but as mentionned before you would need very long ramps. i've seen an F2 Stock car in the back of a daily, but he modified the rear doors to open wider. A luton would be the best way to go. they have the over cab bed space, a flat floor load space with a huge difference in width and usually a 500Kg tail lift. The tail lift needs a minor mod in the way of extending it backwards with ramps for the back wheels, but I'm sure that's well within your capability. Have a look on the 750MC website classifieds for ready to go race transporters or Pistonheads classifieds. You may save a lot of time and effort. Location: Gosport, returned from the far south.